Your garage is one of the most useful, yet neglected parts of your home. It not only protects your car, but also offers valuable storage space for all the things, big and small, that don’t quite fit anywhere else. Your garage can be such a useful space that it’s all too easy to watch it become a messy jumble of plastic tubs, seasonal decorations, and outdoor supplies. Before you know it, you might not even have room for your car! Reclaim your garage storage with help from MCS Closets & More. We’ve been providing innovative storage solutions through custom cabinetry for years, and garage storage is just one of our specialties. 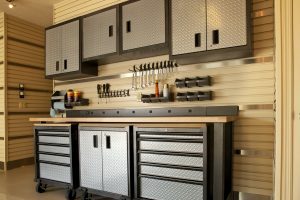 Read on for our garage organization tips and call MCS Closets & More today for your free design consultation! Hooks, pegs, slatted walls — whatever works for you! Empty wall space can be transformed into essential storage space with the right equipment, keeping your tools in sight and keeping clutter off of the floor where you may trip or run over it. Wall mounting is a great option for seasonal and garden tools like rakes and shovels, which are big and awkward but not bulky. If you don’t have cabinets in your garage, or your current storage solutions are really more like storage problems, you should consider custom cabinets. Drawers and cabinets can keep your things off the floor and protect it from dirt and pests. It can also keep potentially dangerous items like poisonous cleaners and pesticides away from any little ones. MCS Closets & More can build exactly what you need — no job is too small! Call today and our designers will come to you to help you design the perfect garage storage. Most garages will have more overhead space than you need. Make the most of it and use it to store bulky or seasonal items. It’s a great way to keep everything at eye-level free of clutter and it frees up space for the items you use more often. Overhead storage is the perfect solution for holiday decorations, like tubs of Christmas lights or the components of your family’s famous Halloween haunted house. Hoist it out of the way or build overhead shelves, and then access it only when you need it. One thing to keep in mind is that you need to make sure that your storage solution is strong, and it might not hurt to install a safety net just in case. When it comes to organizing your garage storage, get creative! There are a lot of ways to utilize the most versatile part of your house, and wall organizers and overhead storage are just the beginning. When you need a lasting storage solution customized to your needs and your space, turn to MCS Closets & More. We can build garage cabinets to your match your specifications and style, and you can keep your garage organized. Whether you need to upgrade your current garage storage situation or you need a whole new system, we promise to use high-quality materials and quote you precisely what it will cost. When you work with MCS Closets & More, you get exactly what you want, without unpleasant surprises. Call today to schedule your free design consultation!